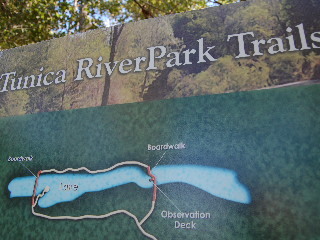 The Ecotrail is an outdoor classroom and observatory, a two-mile long nature trail that is located on the grounds of the Tunica RiverPark. The RiverPark is on the banks of the Mississippi River, near Tunica, Mississippi, which is about 25 to 30 miles south of Memphis, Tennessee. In addition to the nature trail, the park also includes an amazing museum documenting the history of the Mississippi River and the wildlife and flora in, on, and around the river. Four freshwater aquariums are a part of the museum as well, as are displays on The Civil War as related to the history of the area and artifacts from the Native Americans who inhabited the Mississippi River valley. But, back to the trail. This is definitely a nature lover’s delight and a fine example of an outstanding plot in Mother Nature’s garden! The park literature and signs proclaim this to be a great animal viewing area where we might at any time see deer, foxes, squirrels, rabbits, all sorts of bird life, and snakes if we are lucky (or unlucky, depending on your attraction or aversion to crawly critters)! And we did, indeed, see a number of birds and squirrels though no deer nor (thankfully) legless reptiles along the way. What we also did not encounter (no doubt due to the coolness of the late October day we visited) were mosquitoes. I could just imagine that on a sticky hot summer day, this humid wetland area along the Mississippi River would be a place where insect repellant would be a necessity in order for human creatures to enjoy the great outdoors. What excited me most along the trail in this wetland forest were the magnificent and majestic trees native to this Mississippi delta area. They were huge! 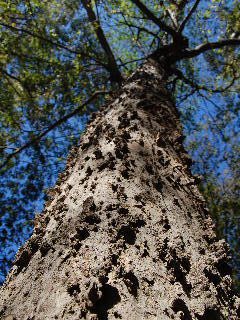 Eastern cottonwood trees, sycamore, hackberry, gum, and ash trees with thick straight trunks 4 or 5 feet in diameter and reaching like living monuments 80 to 100 feet or more into the sky. Just amazing! Any disappointment at the lack of deer sightings was more than offset by our encounters with these lofty and noble giants. How wonderful it is that a great educational museum and observation facility like this exists and is readily available and accessible to the public in the form of the Tunica RiverPark. Check it out if you possibly can. And see if you can walk along that grand Ecotrail through the wetland forest and not be completely humbled by the grandeur of those magnificent trees in this incredible setting!